The Provost’s Office is once again offering support to Duke faculty who are interested in convening a group of colleagues to begin or test a new collaboration around a shared intellectual interest. All proposals must meet eligibility requirements and satisfy proposal guidelines. Proposals should be for one year. Project funds ranging from $1,000 to $5,000 will be awarded for use during the 2019 calendar year. Recipients from grant cycles in previous years represent a broad range of groups and new projects. 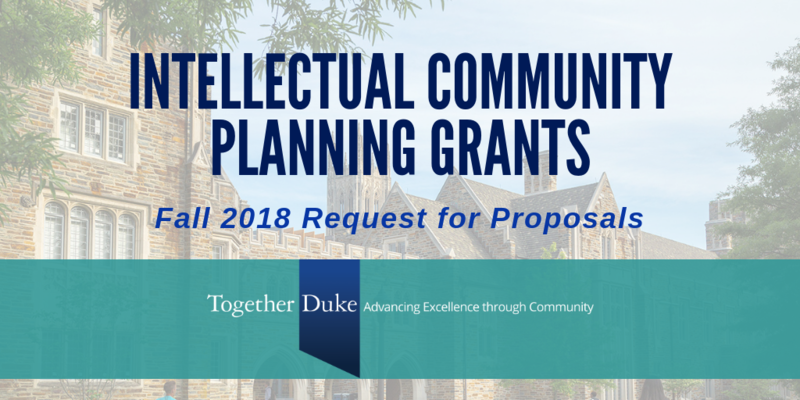 Any Duke regular rank faculty member, from any discipline, is eligible to propose and form a new collaborative group of at least five participating members. Prospective collaborations may be framed around disciplinary, interdisciplinary, or multidisciplinary themes. The search function at scholars.duke.edu is a useful tool to find other faculty who share a particular intellectual interest. Proposals should identify a faculty lead organizer (PI), who should submit the proposal. Collaborative groups that include faculty from the Schools of Medicine and Nursing are welcome to apply, so long as that contingent does not comprise a majority of committed faculty. Potential to build collaborations in exciting intellectual areas for relevant department(s), school(s) and/or cross-cutting institute(s), whether around fundamental/applied research, innovative teaching, or outreach/engagement. Successful proposals will be submitted by the organizing group of faculty who have self- aggregated around a shared intellectual interest, and who want to pursue that common interest in a variety of venues, e.g., small monthly dinner meetings, larger quarterly meetings, workshops, etc. Meetings should be designed to facilitate potential collaboration. Preference will be given to proposals that articulate a clear outcome, provide a plan to sustain interactions, prepare joint grant applications, and/or create a product such as a class, shared research project, extra- or co-curricular offering, etc. The review process of submitted proposals will be overseen by the Vice Provost for Interdisciplinary Studies and the Executive Vice Provost. All proposals, and discussions thereof, will be kept strictly confidential. The intent is that the collective set of award recipients will reflect the richness of intellectual approaches and modes of inquiry that make Duke a vibrant university. Awards of $1,000-$5,000 will be provided to support each successful proposal. Recipients can use funds to cover the cost of food, meeting venue, external speakers or other meeting costs, and/or exploratory research (as by an RA) into potential collaborators at Duke, UNC, NC State, NCCU, RTI, etc. A listing of the organizing core faculty group with 2-page CVs for each. To apply, visit https://www.ctsi.duke.edu/myresearchproposal and click on “Create New User” (or log in if you already have an account). Proposals must be submitted under the faculty lead organizer (PI)’s name. Enter Access Code ‘PROVOST’ then select the Provost’s Office: Intellectual Community Planning Grant opportunity and follow the instructions. Any group of Duke faculty members with a regular rank faculty lead organizer (PI) can apply. Yes, we are interested in collaborations of all types, including those framed around disciplinary themes. No, we plan to have RFP requests again in at least 2019 and 2020. Is there an optimal number of faculty for a proposal? We are expecting to see at least five faculty interested in developing a collaborative group around the shared intellectual interest. What kinds of items and expenses would ICPG funds be able to cover? Funds can be used to cover the cost of food, meeting venue, external speakers or other meeting costs, and/or exploratory research (as by an RA) into potential collaborators at Duke, UNC, NC State, NCCU, RTI, etc. What kinds of deliverables do you expect the ICPG groups to produce? Examples of successful outcomes for an ICPG group include: sustained and/or expanding interactions in the group, a joint grant application, a new educational offering, a Bass Connections project team proposal, a research project, etc. How are the ICPGs different from other proposals, like Bass Connections, and Collaboratories? ICPGs are aimed at faculty groups in the initial stages of exploration of a topic, to begin or test a new collaboration around a shared intellectual interest, and thus provide a smaller level of initial funding. Bass Connections project teams receive comparable funding amounts, but require participation of students at multiple learner levels and a focus on applied problems; the application process also highly encourages engagement with partners from outside the university (NGOs, government agencies, corporations, etc.). Collaboratories are a new opportunity to support groups of faculty working on more established projects that seek to provide tangible solutions to targeted problems in three areas: energy and water resources; race, religion and citizenship; and population health. See 2018 recipients and view all Together Duke initiatives.